What’s up (or down) with your FICO® Scores? What are the four primary credit codes you can only obtain from your mortgage banker or mortgage broker? What do these codes mean to your FICO® scores? What can you do to improve your FICO® scores? Where can you get help? Can one ‘inherit’ credit from a relative? In this regularly published credit blog we will answer these questions and more. As well, we will discuss the most common questions my office gets regarding FICO® scores and home loans. Following are pointers one, two and three for all readers. Four, five and six are for those who have had to file bankruptcy or have been through a loan modification, foreclosure, deed in lieu or short sale. 1) Older credit is better for your overall score. Do not close older credit card accounts. Keep credit cards active by periodically using them. Consider reactivating the same inactivated account numbers, where possible, if you have closed them. Caution: do not get sold on opening a new account with a new account number. The primary goal here is to activate aged account numbers. 2) New lease or purchase credit is not good for your scores. Whenever possible, compensate with the use of older accounts. 3) Do not open new credit accounts to get one-time seasonal or one-time purchase discounts. In virtually all cases, the negative cost to your FICO® scores is not worth the short term discount. 4) When reestablishing credit, keep a small monthly balance (no more than 20% and best with 10% or less) and make minimum payments. Keep in mind you are earning your credit reputation. 5) In setting up a secured credit card, join a credit union. Save two to five thousand dollars or more, and secure this with the credit union in exchange for a major credit card. This is a vastly more sound way to establish or reestablish credit than the more common way, which is by obtaining small secured cards. The smaller balance cards have the effect of trapping one into always having lower limits with sub-prime lenders. Smaller cards do not allow you to rent a car, buy a plane ticket, etc. Think big, take your time. Set up a credit union savings account with systematic deposits (payroll deduction). We will devote a future blog topic to just this subject. 6) On credit utilization, anyone who uses credit cards could have high utilization, particularly those who pay off their balances in full each month. This is because balances are often reported to the credit bureaus mid-billing cycle. So if you have a $5,000 limit and you charge $4,000 in a month, you could be reportedly utilizing 80% of your available credit. The result is most often dramatically reduced FICO™ Scores. 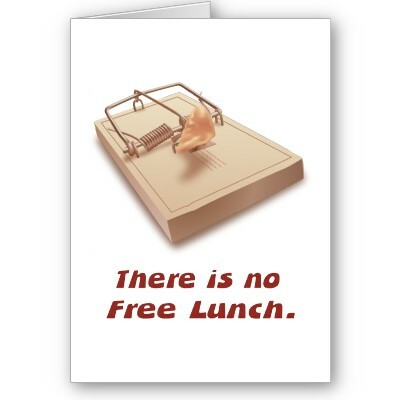 6) Keep TANSTAAFL in mind at all times – There Ain’t No Such Thing As A Free Lunch. This entry was posted in Bankruptcy, credit repair, Credit Scores, FICO, FICO Scores, foreclosure, Home Ownership, short sale, Short Sale, Foreclosure, Deed In Lieu of Foreclosure, FHA, VA, Myths, Uncategorized. ← FICO or FAKO Scores?